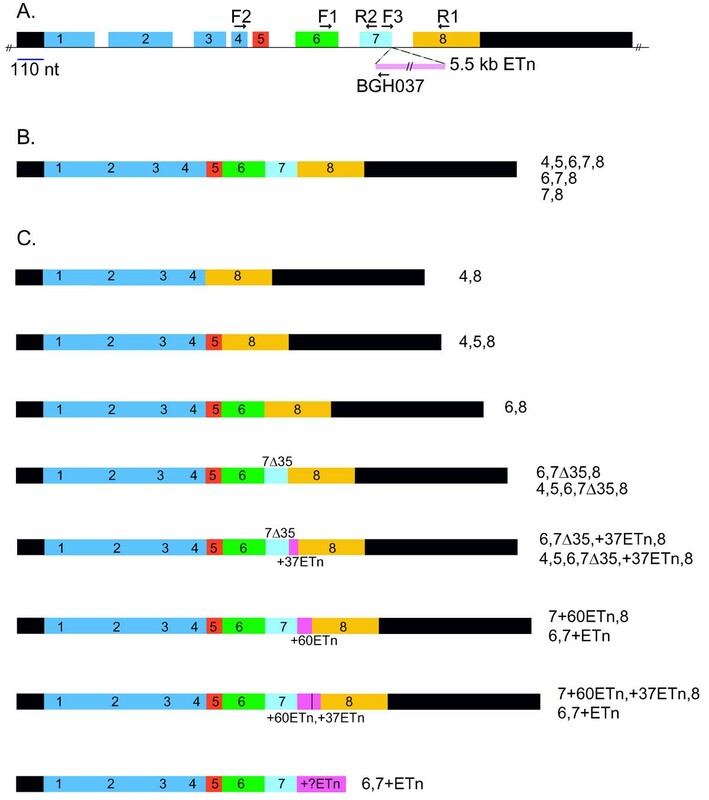 The T Wis mutant allele of the Brachyury, or T, gene was created by insertion of an endogenous retrovirus-like early transposon (ETn) element into the exon 7 splice donor consensus sequence of the 8 exon T locus. While the developmental consequences of this disruption have been well characterized, the molecular consequences have not been previously investigated, and it has been assumed that the insertion results in a truncated protein. This study sought to further characterize the mutant T Wis allele by investigating the nature of the transcripts produced by insertion of this transposable element. Using an RT-PCR based approach, we have shown that at least 8 different mutant transcripts are produced from the T Wis allele. All T Wis transcripts bypass the mutated exon 7 splice donor site, such that wild type T transcripts are not produced from the T Wis allele. This result shows an unsuspected misregulation of RNA splicing caused by insertion of a transposable element, that could have more widespread consequences in the genome. The history of the T locus began with the discovery in 1927 of a semi-dominant mutation in mice, named Brachyury, or T for tail, that affects both embryonic viability in homozygotes and tail development in heterozygotes . This original T allele represents a deletion spanning 160–200 kb (reviewed in ), the developmental effects of which have been well characterized [3–8]. Homozygous mutant embryos show a developmental failure of the notochord and posterior mesoderm, and die at midgestation. Heterozygous mutant mice are born with shortened tails and malformed vertebrae. In 1988, another spontaneous Brachyury mutation, called T Wis , was reported . The T Wis homozygous and heterozygous mutant phenotypes are more severe than those of the T deletion, suggesting that the T Wis allele acts as a dominant negative. Homozygous mutants have no somites at all and heterozygotes have no tail, rather than a shortened tail (reviewed in ). The T gene was cloned in 1990 , and its expression pattern was found to correlate with the tissue types affected in T mutants . Subsequently, T protein was shown to bind specifically to DNA and its preferred in vitro target sequence was identified . It was further shown that T encodes a transcription factor capable of regulating expression of a reporter via the identified target sequence . In their report describing the initial cloning of the T gene, Herrmann et al. also demonstrated that the T Wis allele of T results from the insertion of an endogenous retrovirus-like early transposon (ETn) element into the splice donor site of exon 7 of the 8 exon T locus. They showed that the splice site at the 3' end of exon 7 was mutated from TAG GTATGT to TAG GTGTTG (where underlined sequence is the 3' end of exon 7 and ETn insertion sequence is in bold) and predicted that this site would be nonfunctional, thereby abolishing splicing of exon 7 to exon 8. They proposed that the T Wis allele would produce a transcript comprised of exons 1 through 7 followed by read-through transcription of the ETn element, resulting in a modified C-terminal end, or alternatively, that upstream splice donor sites would be used, shortening the transcript and protein product. In later whole mount in situ analysis, Herrmann  confirmed expression of a T locus-derived transcript in T Wis /T Wis embryos, but did not examine its exact nature. The position of the ETn insertion (see Figure 3A) is compatible with the idea that a modified protein could still bind DNA but might compete with the wild type protein or form an inactive complex with it, thus leading to a dominant negative effect. The aim of this study was to characterize the sequence and structure of the T Wis allele transcript(s), with an eye towards understanding the specific molecular consequences of disruption of the exon 7 splice donor site by the inserted ETn element. Using an RT-PCR-based approach, we have shown that at least 8 different transcripts are produced from the T Wis allele of T. In addition to the mutant transcript predicted by Herrmann et al. , 4 transcripts composed solely of T exonic sequences, and 3 transcripts containing ETn sequences spliced between T exonic sequences were identified. All T Wis transcripts bypass the mutated exon 7 splice donor site, such that wild type T transcripts cannot be produced from the T Wis allele. As a first step in characterizing the molecular nature of the T Wis allele of T, the exact identity of the ETn element inserted into the locus was determined. The primer ETn1 was designed to a region of conservation across related but different ETn. PCR was performed on yolk sac lysates from e9.5 T Wis /T Wis mutant embryos using the primer set F3 – ETn1 (Figure 1A). Sequence analysis of the ~1300 bp PCR product amplified from T Wis /T Wis DNA in two independent reactions showed that the ETn element of the T Wis allele is identical to the 5542 bp ETn sequence, Genbank accession #Y17106, with the T Wis ETn element inserted in reverse orientation relative to the direction of transcription of the T locus (data not shown). Genomic PCR of the T Wis allele ETn element insertion and identification of wild type T versus T Wis allele transcripts. 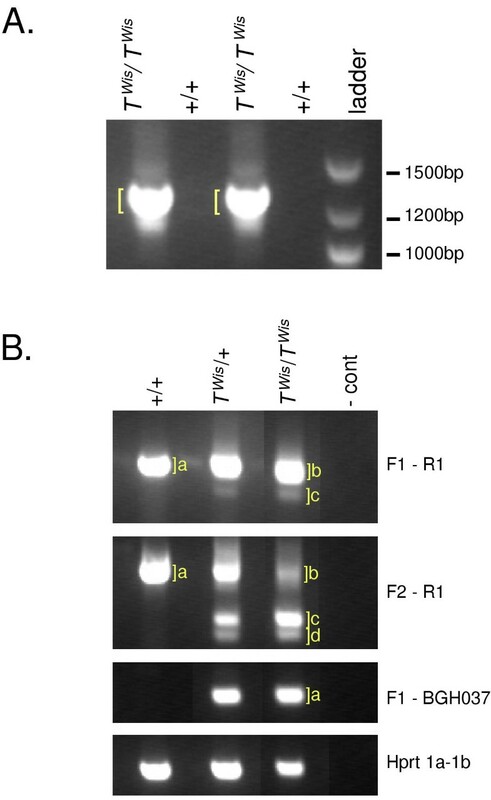 A. Primers F3 and ETn1 were used to amplify a portion of the T Wis allele ETn element. T allele genotype of template genomic DNA is indicated above the lanes. As expected, no product was amplified from T +/+ control samples. Brackets indicate bands excised, purified, and sequenced. Ladder = 100 bp DNA ladder, with sizes indicated to right. B. RT-PCR analysis of T +/+, T Wis /+, and T Wis /T Wis e8.5 embryo RNA. Genotypes of embryos are indicated above the lanes; - cont = no RNA negative control. Primer pairs used to amplify the product are indicated to the right (see also Table 1). Brackets indicate bands excised, purified, and sequenced. Products were named based on the RT-PCR primer set followed by the lower case letter next to the bracket (see Table 2). The next step in characterizing the molecular nature of the T Wis allele was to identify the aberrant transcripts produced from this allele. RT-PCR was performed on RNA from T +/+, T Wis /+, and T Wis /T Wis embryos using forward and reverse primers located in different exons of the T locus, as well as a reverse primer specific to the ETn element of the T Wis insertion (Table 1 and Figure 1B). The RT-PCR products were excised, purified, and sequenced twice on each strand with the primers used to generate them. The F2-R1 products were additionally sequenced one time each with primers F1 and R2. Primers pairs used for RT-PCR analysis of T versusT Wis transcripts. See Materials and Methods for primer sequences. 1 Genomic organization of T locus from [10, 16], and Bernhard G. Herrmann personal communication. 2 Assuming proper T exon 6 to 7 splicing, then read-through transcription from exon 7 into adjacent ETn sequences, in T Wis allele transcripts only. The F1-R1 and F2-R1 primer pair products (F1-R1a and F2-R1a) amplified from a T +/+ embryo represented the expected wild type T RNA species (6,7,8 and 4,5,6,7,8; Figure 1B, Table 2, and Figure 3B. ), while those amplified from a T Wis /T Wis embryo together comprised 5 aberrant transcripts (Figure 1B, Table 2, and Figure 3C.). Transcripts representing an exon 4 to exon 8 splice (4,8), an exon 5 to exon 8 splice (4,5,8), and an exon 6 to exon 8 splice (6,8) were all identified in T Wis /T Wis embryos. An additional mutant transcript resulted from an aberrant splicing event from exon 7 to exon 8 such that 35 nucleotides (nt) of the 3' end of exon 7 were deleted (6,7Δ35,8 and 4,5,6,7Δ35,8). Another mutant transcript included an aberrant mini-exon of 37 nt of ETn derived-sequences inserted between the 3' deleted exon 7 to exon 8 splice (6,7Δ35,+37ETn,8 and 4,5,6,7Δ35,+37ETn,8). Sequence analysis of RT-PCR products fromT +/+,T Wis /+, and T Wis /T Wis embryos. RT-PCR products are named as described in Figures 2 and 3. Products of indicated size were sequenced and compared toT mRNA sequence and genomic structure (Herrmann, Labeit et al. 1990; Genbank accession number NM-009309 ). Transcript sequence indicates exonic organization of RT-PCR products. 1 A comma (,) denotes the joining by splicing of non-adjacent sequences. 7Δ35 indicates an incomplete exon 7 with a 35 nucleotide deletion at the 3' end. 7+ETn and 7+60ETn indicate read-through transcription from an intact exon 7 into adjacent ETn sequences. The +37ETn mini-exon sequence is Genbank accession #Y17106 bases 4515–4479, 5'-GAAACTCAGAAATGGTCAAGCTGGACCTTCCCTTGCA-3'. The +60ETn read-through sequence is 5'-GTGTTGCGGCCGCCAGCAGCTCGCAACGTGA-ACGGTTCGACTGAGAAGGCCGCTCGAGCT-3', where the 5' most G is the first base of T intron 7 , and the remainder of the sequence is Genbank accession #Y17106 bases 5542–5484. 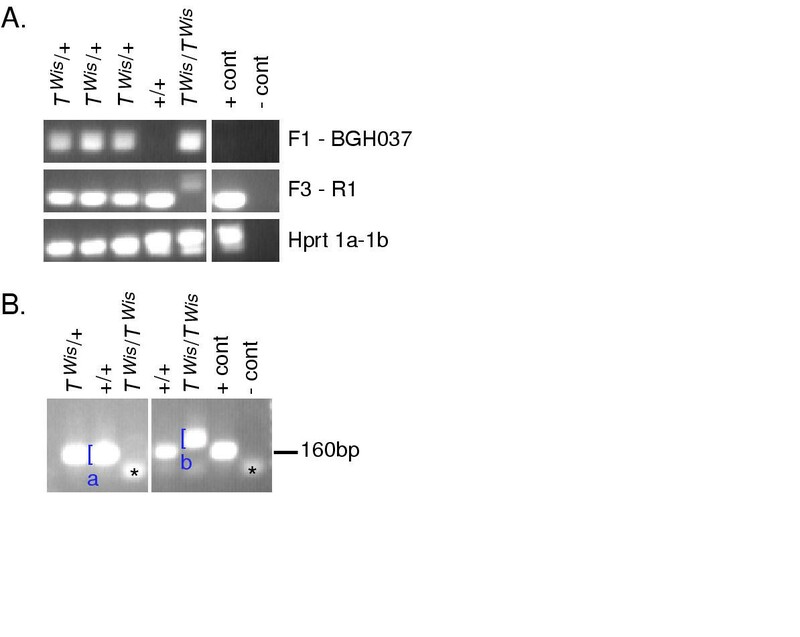 As expected, the F1-BGH037 primer set failed to amplify from T +/+ embryo RNA (Figure 1B). In the T Wis /T Wis embryo, this primer set detected a mutant transcript representing read-through transcription from exon 7 into the immediately 3' ETn insertion (6,7+Etn; Figure 1B, Table 2, Figure 3C). In this preliminary analysis, no wild type T transcript was identified in T Wis /T Wis RNA using any of the primer sets. These results suggest that no T Wis transcripts maintain normal exon 7 to exon 8 splicing, as postulated by Herrman et al. . To further clarify this issue, the splicing of exon 7 to exon 8 was specifically examined using the forward primer F3. This primer is located within the last 35 bp of exon 7, and therefore is deleted in all of the exon 7-containing mutant transcripts already described (see Table 1, Table 2, and Figure 3). RT-PCR analysis with this primer confirmed that while the F1-BGH037 transcript is only produced off the T Wis allele, the F3-R1 transcript is only produced off of the wild type T allele (Figure 2). Examination of exon 7 to exon 8 splicing in wild type versus T Wis allele-specific transcripts. RT-PCR analysis of T +/+, T Wis /+, and T Wis /T Wis e7.5 embryo RNA. Genotypes of embryos are indicated above the lanes; + cont = T +/+ RNA control; - cont = no RNA negative control. A. Primer pairs used to amplify the product are indicated to the right (see also Table 1). F1-BGH037, an exon 6-ETn element primer pair, only amplifies from T Wis /+ and T Wis /T Wis samples. F3-R1, a 3' end of exon 7 to exon 8 primer pair, only amplifies from +/+ and T Wis /+ samples. B. Additional RT-PCR using primers F3-R1. Size, in base pairs (bp), indicated to the right. * = unincorporated primers visible on the gel. Brackets indicate bands excised, purified, and sequenced. Products were named based on RT-PCR primer set followed by lower case letter next to the bracket (see Table 2). In some cases, a prominent band larger than the expected wild type size was amplified by the F3-R1 primers from T Wis /T Wis embryo RNA (Figure 2). Sequence analysis showed that this larger T Wis /T Wis specific band represented two additional aberrant transcripts (Table 2 and Figure 3C). Notably, these two products were never observed in T Wis /+ RNA (Figure 2). A shorter variant contained the intact 3' end of exon 7 and 60 nt of read-through transcription into the ETn element spliced to exon 8 (7+60ETn,8). Given that the BGH037 primer is contained within the 60 nt of ETn read-through, this species is not necessarily distinct from the 6,7+ETn transcript amplified by F1-BGH037, as both could be amplified from the same hypothetical RNA 6,7+60ETn,8. The longer variant contained the intact 3' end of exon 7 and 60 nt of read-through into the ETn element spliced to a 37 nt mini-exon of ETn sequence, then spliced to exon 8 (7+60ETn,+37ETn,8). The 37 nt ETn mini-exon was the same sequence found in the 4,5,6,7Δ35,+37ETn,8 and 6,7Δ35,+37ETn,8 products described above. This species is also not necessarily distinct from the 6,7+ETn transcript amplified by F1-BGH037, as both could be amplified from the same hypothetical RNA 6,7+60ETn,+37ETn,8. Alternatively, the 6,7+ETn product might have amplified from an RNA 6,7+?ETn, where an unknown amount of the ETn insertion was transcribed and the transcript terminated in ETn sequence without being spliced to exon 8. Overall, wild type exon 7 to exon 8 splicing was never identified in transcripts produced from the T Wis allele of T.
Transcripts produced from the T Wis allele of T. A. Genomic organization of the T gene: introns (black line) not to scale; exons (colored boxes) to scale as per scale bar. In the T Wis allele of T, a 5.5 kilobase pair ETn element is inserted immediately 3' of exon 7, as shown by the pink bar (not to scale). (Adapted from [10, 16], and Bernhard G. Herrmann personal communication). Primers used for RT-PCR are indicated (not to scale), where the arrow indicates the approximate primer position within the exon or ETn element. Primer ETn1 used for PCR is located within the ETn insertion approximately 1.3kb 3' of primer BGH037. B. Wild type T transcript: 5' and 3' UTR sequences are in black; ORF sequences in various colors, with exon numbers indicated. RT-PCR products amplified from this RNA in T +/+ embryo controls are indicated to the right (see Table 2). C. Structures of T Wis RNA species transcribed from T Wis allele as deduced from amplified RT-PCR products (indicated to the right, see Table 2) assuming that transcripts are wild type 5' and 3' of the RT-PCR primers used to amplify products. Note that the RT-PCR product 6,7+ETn could have amplified from any of three transcripts. In no case was wild type T RNA detected in RT-PCR on T Wis /T Wis embryo RNA. The characterization of T Wis allele transcripts presented here confirms that the intron 7 donor splice site is indeed non-functional such that wild type T mRNA is never produced. Furthermore, the exon 1–7+ETn transcript predicted by Herrmann et al. was identified. However, at least 7 other T Wis mutant transcripts are also produced (Figure 3C). All of these transcripts serve to bypass the mutated splice donor site; either by splicing over exon 7, activating a cryptic splice site within exon 7, or transcribing through exon 7 into the adjacent ETn sequences. The cryptic exon 7 splice site used, CCT GTGAGT, is a strong match to the C/A,AG GT,A/G,AGT splice donor consensus. It is important to note that in addition to the exon 4 to 8, exon 5 to 8, and exon 6 to 8 splicing events detected here, the potential remains that transcripts resulting from exon 1 to 8, exon 2 to 8, and/or exon 3 to 8 splicing events are produced but were not discovered. Genetically, the T Wis allele acts as a dominant negative in that T Wis /T Wis embryos have a more severe phenotype than the null T/T embryos. However, the biochemical nature of this dominant negative effect is not known. This study confirms previous work  showing the existence of a transcript that would result in a truncated protein if translated. Because the DNA-binding T-domain would be intact, this hypothetical protein could compete with the wild type protein producing a dominant negative effect. Alternatively, the presence of heterologous Etn element sequences in T Wis transcripts may stimulate posttranscriptional gene silencing by an RNA-induced silencing complex (RISC)-based RNAi degradation pathway which could target degradation of wild type transcripts . We have shown that disruption of a single splice donor site within a multi-exon locus can lead to a dramatic misregulation of RNA splicing. A straightforward prediction suggests that in T Wis transcripts, splicing "out of" exon 7 would simply fail and result in a transcript terminating with the ETn element. In reality the effect is much more complex, cautioning against the use of straightforward assumptions in predicting the molecular consequences of genetic alterations. The T Wis allele was maintained on a mixed A/J + C57BL/6 + 129/SvEv background. Embryos were collected from timed heterozygous matings. At e7.5 and e8.5, a portion of the extraembryonic region was removed for PCR genotyping, and the remainder of the embryos placed individually into 400 μL TRIZOL Reagent (Life Technologies, Inc.) for RNA preparation. At e9.5, mutant embryos were identified visually by absence of posterior embryonic tissues . For genomic PCR of the ETn insertion, yolk sac lysates from homozygous mutant e9.5 embryos were used. Genomic DNA from a wild type mouse served as a negative control. PCR was performed in 50 μL reactions containing: template, 50 pmol each of primers F3 (5'-CATAACGCCAGCCCACCTACTG-3') and ETn1 (5'-CACGATTTGTGGGTAAAATAGGAG C-3'), 2.5 units Taq DNA polymerase, 0.2 mM dNTPs, 20 mM TrisHCl (pH 8.4), 50 mM KCl, and 1.5 mM MgCl. Cycling parameters were as follows: initial denaturation at 94°C for 3 min, 35 cycles of denaturation at 94°C for 30 sec, annealing at 67°C for 45 sec, and extension at 72°C for 90 sec, and a final extension at 75°C for 5 min. PCR products were electrophoresed through a 1.3% agarose TAE gel, excised from the gel, and purified using QIAEX II Gel Extraction Kit (Qiagen). Purified products were sequenced twice on each strand with the F3 and ETn1 primers using an ABI Prism Model 373 Automated DNA Sequencer. The ETn elements used to design the Etn1 primer were Genbank #s Y17106, Y17107, and X15598. For genotyping of e7.5 and e8.5 embryos, PCR was performed on lysates of extraembryonic tissue as template, using primers BGH037 (5'-ACGTTGCGAGCTGCTGCGGC-3'), BGH039 (5'-ACCCATGTCAAACCCATCAG-3'), and BGH052 (5'-CCTATGCGGACAATTCATCTG-3'), in a similar reaction mix except for 1.0–1.5 mM MgCl. Cycling parameters were as follows: initial denaturation at 94°C for 3 min, 35 cycles of denaturation at 94°C for 30 sec, annealing at 61° for 45 sec, and extension at 72°C for 45 sec, and a final extension at 75°C for 3 min. The primers BGH052 and BGH037 amplify an ~180 base pair (bp) fragment from the T Wis insertion allele, while primers BGH052 and BGH039 amplify an ~220 bp fragment from the wild type allele. For RT-PCR, total RNA from individual e7.5 and e8.5 embryos was prepared essentially according to the TRIZOL Reagent manufacturer's protocols for isolation of RNA from small quantities of tissue. Total RNA was reverse transcribed using Superscript II RNase H- Reverse Transcriptase (Life Technologies, Inc.) as per manufacturer's protocol, except that all reactions were doubled to 40 μL final volume. RT reactions were performed on one half or one third of the total RNA isolated from an e7.5 or e8.5 embryo, respectively. For positive control reactions, RNA from one wild type embryo was used. Standard RT-PCR reactions were performed with each 50 μL reaction containing 1/8 of an RT reaction, 50 pmol each of forward and reverse primer, 2.5 units Taq DNA polymerase, 0.2 mM dNTPs, 20 mM TrisHCl (pH 8.4), 50 mM KCl, and 1.5 mM MgCl. Cycling parameters were as follows: initial denaturation at 94°C for 3 min, 35 cycles of denaturation at 94°C for 30 sec, annealing at 65° or 64°C for 45 sec, and extension at 72°C for 45 sec, and a final extension at 75°C for 3 min. RT-PCR products were excised from gels, purified using the QIAEX II Gel Extraction Kit (Qiagen), and sequenced in an ABI Prism Model 373 Automated DNA Sequencer. Primers used for RT-PCR and/or sequencing were: F1 (5'-GTCATCGCCCTACCCCAG-3'), R1 (5'-GTGTGCGTCAGTGGTGTGTAATG-3'), F2 (5'-CCCATTTGCTAAAGCCTTCCTTG-3'), R2 (5'-AGGCACTCCGAGGCTAGACCAG-3'), BGH037 (5'-ACGTTGCGAGCTGCTGCGGC-3'), and F3 (5'-CATAACGCCAGCCCACCTACTG-3'). RT-PCR reactions using primers Hprt1a (5'-CCTGCTGGATTACATATAAGCACTG-3') and Hprt1b (5'-GTCAAGGGCATATCCAACAACAAAC-3') served as positive controls amplifying a 354 bp product from the ubiquitously expressed hprt transcript . We wish to thank Timothy Bestor for encouragement and helpful discussion, Bernhard G. Herrmann for providing the genotyping protocols, sequence information and helpful discussion, and William Dove and A. Schedlovsky for providing the T Wis mice. This work was supported by grant RO1 HD33082 from the NIH. SNG carried out the molecular studies and drafted the manuscript. VEP participated in the design of the study, analysis of results, and writing of the manuscript. Both authors read and approved the final manuscript.